Hand out a generous business gift with a unique Branded photo frame thats customised with your corporation brand name and logo? 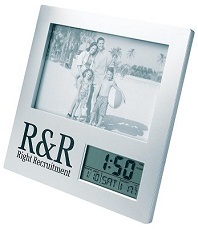 Featuring a clock, alarm function and electronic temperature gauge, you can offer more than just a picture frame, but a genuinly useful picture frame. Personalise this, and perhaps insert your staff / company members photograph so they can remember you clearly. Gain retention and expand business opportunities today! With a customisable screen print area for your company logo, more and more customers will take notice of your corporate logo and message and business will certainly improve.